Do you remember when you first played Minecraft and were amazed at how this simple, blocky game could make you feel like you were immersed in another world? This pack is designed to enhance that feeling. No "magic block" tech mods. No creative flight rings. Instead, we have mods with realistic transport, survival and technology mechanics that make the game feel even more immersive. This pack is not designed just to be overly difficult. But, it is more challenging than most kitchen sink tech packs due to the realism added by mods that require more planning, present interesting layout challenges, offer more realistic transportation options, and tweak survival mechanics. You'll find yourself in a world that feels alive and real. For a lighter version of this pack designed to perform well on less powerful computers, check out Real Tech Light. If you're having fun with this pack, tell me about it. If you're having problems or have suggestions, please post them in the Issue Tracker. Hello! i have a problem with this pack. the game writes me that the serene seasons and the Though as Nails are incompatible. And though as nails expansion mod isnt working only if i deleted. Have you changed anything or updated any mods? Where are you seeing this error? As soon as i start the game than crash. No i didnt change anything. I think i made it but now the game writes me Error: java.lang.NoClassDefFoundError: toughasnails/api/season/SeasonHelper that. Anyways, thanks, I will figure out the server myself for now, I know you're probably busy recording a new episode for your youtube channel, I follow it closely cause the start of the game is different, having to produce fresh water, not that easy. Thanks for the feedback! I don't usually post server packs because it would just be the mods, config and scripts folder. Most people use control panels these days, so there's no point in writing scripts. Those who don't use control panels would probably rewrite any script I would provide anyway. If you include those three folders along with the same version of forge that the client uses (my packs are almost always at the current recommended version), it should work. Let me know if you run into any problems. Hey, I've been looking for a pack like this one for a while now, and I'm so glad to have found this one. I greatly appreciate all the hard work that goes into creating a pack. I would like to run a server for me and my two sons to play together, but I'm having trouble finding the server files. Would you be able to help me out with this? It would be great if you had the server files available. Thank you for your time, and keep the YouTube videos coming. I usually don't post server packs, because these days, it's rarely necessary to change anything between the server and client, and most of us use some kind of control panel which negates the need to write a script. You can just grab the config, mods and scripts folder and drop them in your server directory along with the recommended version of forge. Let me know if you run into any problems or have questions. Nice, simple and underrated modpack. Are you planning to make some quests(guide) for it? Or add some sort of custom(simple) progression? Thanks! I've definitely been having fun with this pack. I don't have plans to make quests. 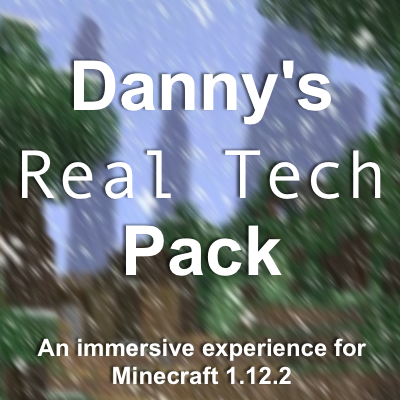 I'd like to keep this pack true to the sandbox aspect of Minecraft, and I feel that quests can distract from that. A guide would be a good idea if I had the time. There are a lot of complex mods that may be new to most players. You do spawn with an akoshic tome with all the mod books though. Hmm... Does the smoke have a way to escape? It may help to have a chimney block next to the controller to direct the smoke.